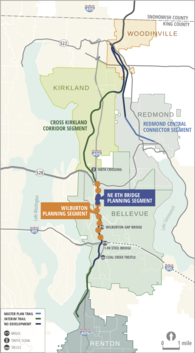 Come view the latest conceptual design plans for the Wilburton segment of the Eastside Rail Corridor on Tuesday, October 9 at Bellevue City Hall. We'll be gathering feedback about this section of the trail, which runs from I-90 north through Bellevue to 108th Avenue NE near Kirkland. Can't attend the meeting? We'll have an online open house from Oct. 9 to Oct. 23, where you can view the plans and provide input. Tell us about regional trails. Do you use them? If not, why not? What do you like about them? How could they be better? We want to hear about your experience on our regional trails – take this four-minute survey to help us understand how we can improve regional trails in the future. 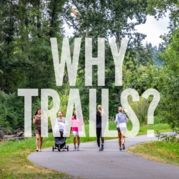 Regional trails are those wide, paved trails or hard gravel paths with gentle grades, such as the Burke-Gilman, Sammamish River, Interurban, Green River and Cedar River Trails. But wait...there's more! Complete the survey and be entered in a drawing for the chance to win two nights in a yurt at Tolt-MacDonald Park. Just include your email address at the end of the survey. The survey will be open until Friday, Oct 5th. Thank you for helping us continue the awesome!